Since April, 2016 I have been working closely with several regional radio groups to establish a city-wide data network. The network will use frequencies in the 900MHz, 2.4GHz and 5.8Ghz range and will use TCP/IP as a base protocol. The purpose of the network is to connect EOCs, radio clubs and individual radio operators using a highspeed backbone. The intent is to create a network that is faster, easier to use and less prone to congestion then traditional VHF packet systems. The network will feature both Internet connectivity and 'off-net' services which will be hosted within the network and available regardless of Internet connectivity. Distribution site for client connections - Triangle Mountain also serves as a major distribution site for client to access the network based on the HamWAN Standard. There are currently two, 120 degree sector antennas aimed at 40 and 80 degrees. 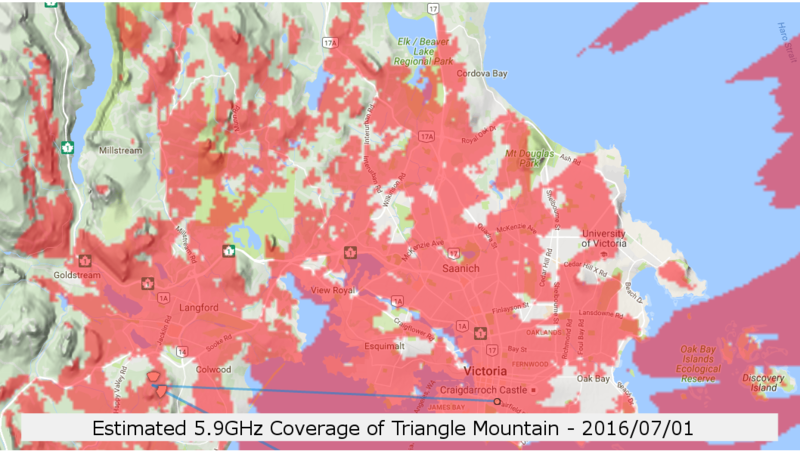 Together, these sectors provide theoretical coverage to most of greater Victoria, however, because the sectors operate on 5.9GHz reception is easily blocked by trees, buildings or other obstructions. Active work is underway to source new radio sites which will increase coverage. Datacenter for 'off net' services - There is a router and server colocated at Cube Global Storage which is a major local datacentre and colocation provider. Cube's facility is built to withstand a magnitude 9+ earthquake and they have full power backup from both UPS and generators. Cube is currently linked back to Triangle Mountain via an out of band 38GHz link and 2.4GHz, 5.8GHz and 900MHz radios have been installed on the roof for testing. Client node at Red Cross - Red Cross House is the home to WARA's emergency radio room and it is the first client node on the network. Red Cross currently serves as a working proof of concept for how the network could be integrated into an EOC. WARA uses the system to remotely access the PC in the radio room so net controllers can remotely operate VHF packet radio. The system is also used to provide Internet access during club meetings. Hardware consists of a Mikrotik Metal 5SHPn radio and an L-Com HG5827EG 27dBi grid antenna. The site currently receives a signal of around -75dBm giving speeds of up to 10mbps. While one of the goals is to provide redundant Internet connectivity to all stations, a secondary goal is to host 'off net' services which exist within the network and will always be available regardless of external connectivity. Chat Server - A simple chat server based on the mattersmost open source application. The server is accessible via a web browser, dedicated PC application or mobile application. The service is available from the Internet and from within the network and is fully self-contained so it will be available regardless of Internet connectivity. Register an account on the server to gain access. DNS Servers - There is currently a single DNS server with two IPs; 44.135.219.21 and 44.135.219.25 which handles DNS for the entire network. Note that this server will only be recursive for queries originating from WITHIN the network, so you cannot use it as your DNS server from home. The DNS server is also authoritative for several subdomains. Web Hosting - Web servers running the Apache software are currently running out of the Cube datacentre. Currently, there is an internal wiki along with a cloud storage website and the potential to add new sites in future exists. There is a fully functional HamWAN implementation in the Puget Sound area comprising of seven mountaintop distribution sites. HamWAN, in co-operation with WARA, has deployed a fully functional distribution site at Triangle Mountain in Langford which connects back to the Puget Sound Network via radio (see above). Backup Internet connectivity is also provided via this radio link. BCWARN - BCWARN stands for British Columbia Wireless Amateur Radio Network and is primarily based out of Metro Vancouver. BCWARN currently receives its Internet uplink from UBC and has sites at key locations including the VE7RPT repeater site, Surrey, NewWest and Coquitlam Amateur Radio Clubs, Mt Bruce on Saltspring Island and Bowen Island among others. Active testing and negation is ongoing to link the Victoria system to BCWARN.